Chicago DJ Equipment Online Superstore - PRO CABLES & WIRING AT THE LOWEST PRICES! The Production Hub comes with DJ-essentials: A perfect combination of six AC outlets and four USB data ports. The fast-acting suppression circuit quickly responds and clamps transient voltages to safe levels. This high quality IEC cord can be used to power many different types of electronic equipment including instrument amplifiers, professional audio equipment, computers and more. This is a 3' right-angle IEC Power Cable. This is an 8' non-polarized IEC C7 Cable from Hosa. The Hosa PWA-421 is a grounded IEC electrical adapter for connecting hardware cables. This is an 8' polarized IEC C7 Cable from Hosa. The Hosa PWD-402 gives you a convenient way to daisy-chain hardware. This Female IEC cable has a female grounded extension at one end and a male grounded plug at the other end of a 2ft. cable. 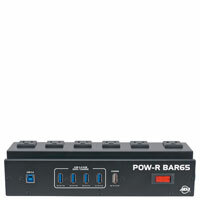 16 Gauge, 1 ft - UL Listed, Heavy Duty AC Power Cord. 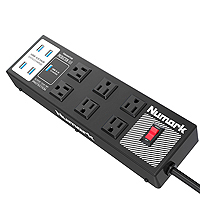 A perfect solution to fully utilize your power strips! 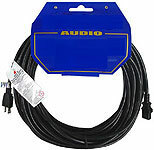 14 Gauge, 10 ft - UL Listed, Heavy Duty AC Power Cord. 16 Gauge, 25 ft - UL Listed, Heavy Duty AC Power Cord. 14 Gauge, 15 ft - UL Listed, Heavy Duty AC Power Cord. 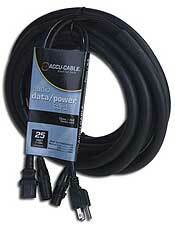 14 Gauge, 25 ft - UL Listed, Heavy Duty AC Power Cord. 12 Gauge, 25 ft - UL Listed, Heavy Duty AC Power Cord. 14 Gauge, 50 ft - UL Listed, Heavy Duty AC Power Cord. 12 Gauge, 50 ft - UL Listed, Heavy Duty AC Power Cord. 12 Gauge, 100 ft - UL Listed, Heavy Duty AC Power Cord. The Hosa YIE-406 is a convenient way to connect two standard IEC hardware items to one male outlet plug. Made with heavy-duty 14-gauge wire, the YIE-406 comes in a 1.5-foot length. A 15 amp-rated assembly packed in a secure-locking, compact housing, 12/3-type SJOOW cable with 3 individually insulated 12 AWG-stranded conductors inside a larger jacket, Highly durable, oil- and moisture-proof, and resistant to kinking,The PWRCON/15M-10 should not be connected or disconnected under load or live. These high-quality extension cords are made to handle the demands professional sound engineers encounter in the entertainment industry. 6' 16 gauge 3-conductor electric cord. A 15A-rated assembly packed in a secure-locking, compact housing. 12/3-type SJOOW cable with 3 individually insulated 12 AWG-stranded conductors inside a larger jacket. Highly durable, oil- and moisture-proof, and resistant to kinking. The PWRCON/15M-25 should not be connected or disconnected under load or live. These high-quality extension cords are made specifically to handle the demands professional sound engineers encounter in the entertainment industry. 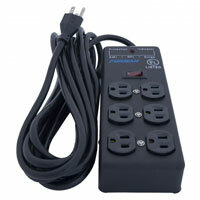 Cords with Power Block provide a heavy 3-outlet connector.6' 14 gauge electric cord with 3-way power block (3 female sockets).